PCRecruiter serves recruiting, staffing and HR sourcing professionals in organizations of all types. The client base includes single-recruiter firms, non-profits, and Fortune 500 corporations alike. PCRecruiter by Main Sequence Technology is a powerful web-based solution for recruitment, HR sourcing, RPO and staffing. Featuring Outlook integration, mobile access, integrated job posting, candidate screening, virtually unlimited storage, automated resume import, full text searching, VOIP integration, import/export from major 3rd parties, and completely configurable data views. The Main Sequence team has 20 years of service to the human capital industry and thousands of customers worldwide. -Can't search for record activities (i.e. sent someone an email) and record data (i.e. in the state of Texas) at the same time. Cumbersome process of having to do one search, save those results to a list, do the other search, and filter by that list. Since this review was posted, we have updated our bulk-email features and can now schedule future sends, use dedicated accounts for marketing emails, and handle resends/bounces more effectively. Other improvements have been made to address some of Scott's previous concerns. And of course many other upgrades have been made in the past year+ of time! We are always listening to our users and making changes based on their feedback. Overall: I have used PCRecruiter for over 10 years now. The product takes some time to learn, but once you invest the time to learn it's functions, it provides an amazing solution for the recruiting function. I have used this product in three different companies and implemented it with two clients at the corporate HR level. Because of its flexibility, PCRecruiter can be just about anything you need it to be... and MORE. The training department and technical support have always been able to get me and my team back on track when we have had issues. Up time is extremely important to us and our clients, and PCRecruiter has never failed us. I can think of only one time in the past 10 years where we have had a system failure that lasted about two hours. The product is very reliable. You need to spend the time necessary to learn the product. It's not necessarily a con, but more an investment. You will get as much out of this product as you put in. Spend the time with the training department and implementation team to explain exactly what you are trying to do and they can make it happen. Another option is to ask them for best practices... either way, if you are willing to learn how to use the product, it will pay off tremendously. Cons: None as long as you are willing to learn the products capabilities and spend the time necessary to set it up correct the first time. Recommendations to other buyers: You need to spend the time necessary to learn the product. It's not necessarily a con, but more an investment. You will get as much out of this product as you put in. Spend the time with the training department and implementation team to explain exactly what you are trying to do and they can make it happen. Another option is to ask them for best practices... either way, if you are willing to learn how to use the product, it will pay off tremendously. Pros: Flexible and can be customized to fit user needs. Many options. Internet based so can be accessed from anywhere. Cons: Sometimes customization requires a lot of adjustment to work just depending on what you are trying to do and reporting can be a little confusing until you spend some time on it. We have been using PCR8 still so some of this may have been improved in V9. Overall: Our agency has been working with the PCRecruiter software since 2011 when we adapted it to our use for job placement services in the public workforce system. We started our on a totally paper-driven filing system. With our focus of helping prepare job seekers for the interview process and recruiting for employers to fill their job orders, we needed a software tool that could provide the recruiting tools but also an electronic file management system to track data on the job seekers and their activity. PCRecruiter provided all of that and then some with a little help from the MainSequence software development team. Since our use extended beyond the basic focus of the system it took a fair amount of customizing profiles, activities, reports, and related to get it right to where we needed the software to be. Fortunately PCR allows for this. You can customize a large portion of the software to meet your individual needs. The support techs were very helpful in creating our first evolution and we have continued to refine our database since that time. I think I've only stumped the techs once or twice but they eventually uncovered the solution to my issue/question. Once we pioneered the system for our workforce needs, several other partner agencies and employers also picked up on this great tool and began using it when they saw how effective it was with data management. 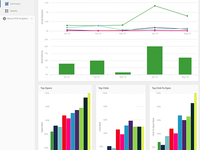 The speed at which we can pull demographic data and get a snapshot of current recruiting patterns is great. Yes, the costs associated can be tough depending on your number of users but this is true for any of the top recruiting/electronic file management systems. It takes a little getting used to at first, especially some of the Admin functions, but once you have the basics down the software becomes very intuitive. Rarely have we found something that we could not get the software to do. Overall, an essential workforce/recruiting software tool to help efficiently maintain information. My best and most critical resource for recruiting success! 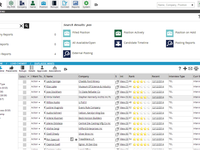 Pros: PC Recruiter is, hands down, the best recruiting CRM software I have found on the market. Its functionality is way beyond any of its competitors. As a CRM consultant, I have high expectations for CRM software, and this program has exceeded them. In fact, I found that there were a whole lot more resources than I had anticipated: easy-to-use plugins for Outlook and Chrome, extensive options to communicate with clients and candidates, and a robust database that is able to take all the information I need, put it where it is easily accessible, and then be able to get a comprehensive "picture" of what I need to know. I have used other programs and the general attitude of the other vendors is something like this: "Here's what it is . . . here's how it works . . . it's up to you to figure out how you can make this work for your business." Using spreadsheets and Outlook was more efficient than what they offered - which is what I had to use in the past with certain software programs. When it comes to PCRecruiter, it's as if they asked me what I needed and then built a great program . . . and then asked me what my "dream" software would include . . . and then they met and exceeded my expectations. The salesperson asked me a lot of questions and then made sure the software and my eventual training addressed my needs, rather than talking at me about its capabilities. After trying the "best" programs and, frankly, finding no comparison to PCRecruiter, I don't want any of my competition to use it - I like having a clear advantage. Cons: There isn't anything I don't like about PCRecruiter. It would be great if they gave the software away for free, but with the price being lower than a lot of their competitors . . . again, I can't complain about anything with PCRecruiter. Recommendations to other buyers: I found that a lot of the software out there does not have a easy way to work with LinkedIn, Outlook, and importing resumes in general. There is nothing worse than having to input a whole bunch of data when you can see what you need on the screen and you can't import it. Also, find a software program that is specifically built for recruiters and not just modified for certain industries. (Zoho?!?) In addition, test out the functionality of the programs and don't rush the process - many of the salespeople want to get you into a deal without allowing you to really use the program. Lastly, watch out for the "big programs" that say that they have millions of users - many of them have limited functions and capabilities. When you figure out your processes and then compare them to the programs out there, you will find that many of these programs will make you do a whole lot of work that other programs have optimized that work. Highly Functional, very adaptable and great customer support. Pros: I am the IT and Business Consultant to a medium sized Recruiter / Placement Business that specializes in a niche market across USA. We have used the web based version of PCRecruiter for 8 years since 2008. As a medium sized business we did not want to fund a custom built program but needed the flexibility to be able to adapt the system in a similar fashion to having our own purpose built system and internal developers. I first evaluated PCRecruiter (PCR) against several competing products in mid 2008 and found it to be the most versatile for our purpose. The only program of it's type that delivered everything we needed, plus expansion possibilities, was PCRecruiter. Periodically I conduct a similar review for the business and have yet to find a system that offers an advantage over PCRecruiter. In the 8 years since we started using PCRecruiter we have expanded the system with several customized modules which have been possible within the system due to it's flexible architecture. Finally I would like to make special mention of the customer support which has proven to be second to none. Cons: I don't really have a dislike about the product or vendor. You usually only have dislikes when the service and product are not up to scratch. Recommendations to other buyers: Try to work out what your future needs will be and whether the system will be able to adapt and evolve with you. As an IT and Business Consultant I have found that businesses always change and every change triggers a new change! Pros: Easy to use, reliable, scale-able, customizing options galore, can be conformed to fit your style, and is easy to use 'on the fly'. For beginners and advanced users, there is excellent training available. If you're stumped on an issue there is excellent LIVE support available. And these are knowledgeable support people who understand our business. Cons: I honestly don't have a complaint! Overall: I've used Main Sequence's PCR for many years and it is truly the recruiter's companion. Do you think you have what it takes to bill a million plus? You might, yet not without the right tracking software. I should know because I've billed many millions using this system and this is the system that made it possible. High billing activity takes a system that is easy to use, scale-able to large volumes of activity yet useful for part timers, saves time, performs solidly, and has the backing of a knowledgeable support team. I've explored the options and nothing compares. Recommendations to other buyers: I recommend using both the Web version and the Portal versions in unison. It's the best of both worlds if you enjoy using MS Outlook. Outstanding value and the features are world class. Pros: I have used the biggest and most popular ATS systems in over 10 years as a corporate recruiter in Fortune 500 environments. Now that I am an independent headhunter, I am amazed at how much value and features you can get out of a smaller ATS like PCRecruiter. Some of these include being able to upload information and profile pictures in a few quick steps. The most amazing thing about PCR is the tech support. You can call and get an immediate resolution to almost any issue. If it can't be resolved right away they make a point to get it done in the matter of hours, not days and weeks. Lastly, the price is right! Cons: There is not much I don't like as the software is very user-friendly. About the only thing is being able to change the color scheme. Thank you for the glowing review, Manny! And we do have alternate color schemes on our "to do" list in the development department. Pros: I like the integration and all the features, from recruiting, database, sales, the ability to manage and drive the whole process in one place that makes it very useful to upload information and communicate and track all processes from the client to the applicant, recruiting, sales and it is flexible to be able to support any discipline or industry. Cons: It takes a little while to get used to the system and to learn all the different modules.. it's very robust. Saying that, the support team and training team are very responsive and help so much when I need to learn something knew or if I have support issue it has been resolved quickly 100% of the time. Then entire company that I have spoken with or needed their help has always been responsive and very friendly and easy to work with. Pros: Usability - the automation of the system is great. Spend the time setting things up and you won't regret it. Move the candidates through the process (Drag and drop) and relevant messages are sent out. Outlook connector is a great integration for communication tracking. Support are very responsive. Cons: Initial setup takes significant time (for one person) when transferring from a bespoke system. Not completely unexpected, but was surprised it was so difficult to set up the system the way we wanted it in the test environment, and then wanted to transfer over live (most recent) data. Worked out in the end, but it was different from they way I thought the process would go. Overall: Overall, very good. Initial time setting everything off pays off in great time-saving later for the team. Big improvement from previous version but . 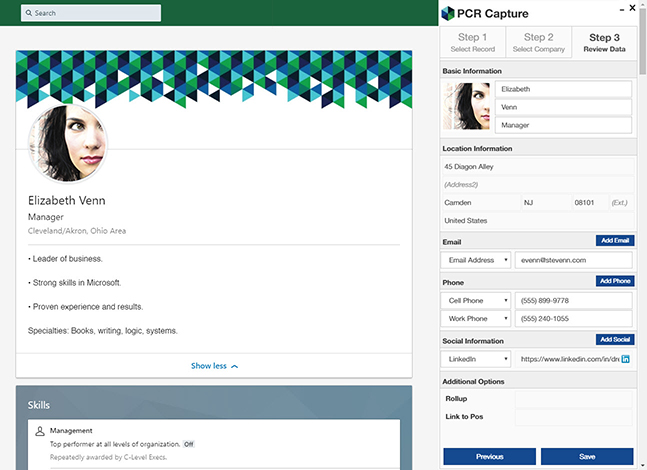 . .
Pros: Everything about it is a time saver designed so that you don't have to go back and forth from PCR to LinkedIn, which is fantastic. Huge improvement overall but . . .
Cons: The only problem I noticed with this version was that - despite what the training video says - it does not give you the option of adding a name to a rollup "on the fly". Instead, you have to designate the rollup in the default settings. The video specifically mentions that this is not the case anymore, but I just downloaded this latest version 5 minutes ago and there's no option to choose a rollup on the fly. I imagine that will be fixed soon, however, and when it is it will be perfect. Overall: It's a time saver, helps me stay organized, and ultimately helps me put together more deals! It is also affordable and priced correctly. Comments: Setting up a system like this is always difficult. We found that, with the exception of some custom forms that weren't completed to spec, this system was easy to setup and nice to use. Pros: Once PCRecruiter is setup, it is easy to use. It has many great features, like a memory of what you accessed last, so you don't have to remember which candidates you were working with. If you use the integration with Outlook, most recruiters won't have to use a separate browser. The ability to write custom SQL queries and the smart merge capability of the import process are also very nice. Cons: The interface is a little dated. I believe they are working on updates though. If you hire them to create custom forms or applications, it feels like you get a contractor who may not know what they should. Their other support staff are great though. The in program email system could use some work. Setting the system up to pass through Office365 exchange servers with a generic email account, didn't work out. We ended up spinning our own exchange server to handle it. Pros: Probably the best feature for me is that it can be customized/modified for ease of use. I'm sure not two companies work exactly the same way, and the database(s) are modifiable so that you may capture important information overall and metrics that are important to YOU. Cons: The more advanced functions are not as user-friendly as I would like them to be. Also, our training was less than optimal. Overall: Coming from a Resumate program (cue prehistoric dinosaur sounds), this is SO much better than what we were using. There are some problems, and online documentation is definitely NOT as good as it could be. That said, we've really enjoyed using PCRecruiter, and have had good customer service from Sales and some of the other customer service people. Pros: Ramp up time on use is very user friendly. Ease of looking up in "Help"
Cons: Took more months than anticipated on data conversion. If you have a older version software, than needs lot changes to convert, be prepared for 6 months to convert. We had anticipated 3 months. Overall: We had an old database/recruiting software that was not cloud base. Having cloud based software has made much easier use for our user. PC Recruiter has bee very responsive to our needs and also quick in response time when having a problem or question. Comments: My organization is an RPO company in which we engage multiple clients. In most of these engagements, we bring an ATS solution. We use PC Recruiter as our primary system. We have worked with the team from PC Recruiter for almost a year now and have had great success with their ATS. Overall we are very satisfied with the functionality and features of the system. Pros: The greatest "Pro" that I can point to is the team at PC Recruiter. They have been extremely responsive to our needs and have been there every step of the way as we configure and deliver their system. They have also been very willing to receive feedback and develop upgrades that have been "game changers" for the way we work. The Customer Service team is fantastic. Very knowledgeable and timely in their responses. Cons: Some of the system terminology and field names are confusing. The system is not overly intuitive. There is a bit of a learning curve if you want to leverage all of the bells and whistles that PCR has, but the Customer Service team is very helpful in helping you in your education. Pros: Customizeability (Is that a word)? You can customize the software pretty easily. For instance I have a field where I can tag someone a "walking placement". Then I can search a city for all of those that I tagged with that term. There is so much you can do. Cons: I am concerned that support for 8 will go away. I've been using the old school version for over a decade and I don't want to learn 9. If I have to I guess I will but would rather keep it old school. Overall: I live on PCR. It's my job. Don't know what I would do with out it. Thanks for the review, Mario! PCR 8 isn't going anywhere for the foreseeable future, although you'll be missing out on an increasing number of improvements, enhancements, and integrations in PCR 9+! Cons: job board. I would like to have a search feature on the homepage, and I would like more customization features for the job board. Overall: We are able to track almost everything in our recruiting process. We would like more information on what we can leverage or best practicies that other offices use to leverage PCR. Julian - get in touch with us regarding the job board items, as we may be able to accomodate more customization. Homepage-located search is on our internal wishlist as well, although coming up with a method that will work on various platforms (SquareSpace, WordPress, etc.) is a complicated thing. Glad you you're otherwise satisfied! Overall: Main Sequence is an excellent partner, we have customized our system and have several databases firewalled off. This is an awesome system for a small to medium size organization that is growing. We've had the pleasure of expanding our organization and were able to do so easily in PCRecruiter! Pros: The most interesting thing is that it's not very cluttered with lots of information and choices. There are few things that are laid down as given but are helpful in making it more easy to comprehend. It is well-integrated with our website and makes data integration smooth. Finding the source of information is clearly demarcated. Cons: It takes a while to understand the flow and to learn the features that can be imbibed with the information. Lot of things, in spite the fact that the training is over, are yet not known to me, and as I put forth my questions to the technical support, I get to learn new features that were not told in the training session. The technical support is fast and helpful. Sometimes, you don't know when you do something, and that comes out as a different end result, and you get stuck as to what went wrong. Recommendations to other buyers: Its nice software, and if the training sessions become more elaborate, it would be a lot easier to use its features. Its plus point is the ease with which it connects to your website, although you need to have someone put the link in the source code of the website. Sometimes, the trainer might be so well-versed that he would not understand the trainees' ignorance about the usage, and that gap needs to be patched. Also, each and every tab in the menu needs to be introduced, whether or not that feature is going to be used by the trainee or not. It might give an insight to the user. 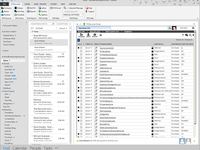 There is just one System tab to make all changes in the look and feel and working of the software. The monotonous work is made interesting by easily changing the look and feel of the page when needed. Its feature of blinding the resume is great, which was not seen in most other software. Great product with full support! Pros: Amazing support willing to jump right on fixing any issues. Website job portal sync's great. Large selection of search options. Cons: Difficult to learn and figure everything out. Overall: We are a small staffing company that has been using PCRecruiter for nearly 7 years. They are very responsive to our needs. Whenever we need to make changes or have something fixed, the PCR team has been right on top of things. They even go above and beyond our requests. This is a great product with the support that exceeds what we are used to. Recommendations to other buyers: One of the few vendors where we feel they actually care about us as a customer. It is refreshing! Pros: I've evaluated multiple recruiting platforms and PCR is by far the best in regards to functionality, extensive customization tools, compatibility with telephony, digital campaigns, analytics, and uptime. Cons: I believe some of the reporting features could be easier to use in most search firm applications. There is a full spectrum of report capabilities but at times I find them more complicated if you don't have help setting them up to fit your company. Overall: My experience with PCRecruiter is exceptional. I couldn't run my business without it. Pros: Layouts setup exactly how and where I want see the information helps productivity. Entering candidate resumes and personal data is highly automated. Individual users can set it up the way they want to create a workflow that makes the most sense for them. Cons: PCR is optimized for Chrome. Overall: PCRecruiter lets me easily configure the system to the way I think and work, without having to worry about functionality or programming. Setting up form letters and agreements to populate candidate/client specifics, save preparation time and enable fast, accurate action. Recommendations to other buyers: Try it! You'll like it. And it is priced right. it's is not personalizable and not easy to use compared to other software. Pros: It is basic and lower in price but you get what you pay for. There are no options to personalize or change anything. Cons: It is not easy to use, the training on this software takes a lot longer because of the hard to use features. Hello Lara - One of PCR's strongest features is actually the ability to customize the fields, screen layouts, and functions to suit. This does, however, sometimes lead to more involved training because every setup is a bit different and each client uses their own fields and layouts rather than a required stock workflow. I'd recommend reaching out to our support team with details on your personalization and change needs. It may be that the options you're seeking are actually there, but just not visible under your particular security settings or not exactly where you're looking for them in the system. PCR is perhaps one of the most configurable recruiting CRMs available, so if you're finding it coming up short on customization we may be able to help further. Recently implemented the newest PCR responsive job board for a global environment. Pros: Simplicity . Very intuitive software which our internal HR team has easily adopted. Reliability. No downtime in my experience. Customer Service. Best customer service interactions I have experienced on so many levels. Overall: It really serves all our needs, and then some. Most internal HR departments fail on the Candidate experience and on being disciplined in consistently applying recruitment processes. PCR allows you to focus less on the tool (its intuitive and reliable) and more on the recruitment processes..... which is where the true value is. Comments: PCRecruiter has more useful features, such as the LinkedIn parsing feature with pics, than enterprise versions of large ATS products like Taleo. You can keep all your business in one place, including contractors. Interfaces with Quickbooks, but not the online version. Pros: Support team-can make changes or additions to software fairly quickly; customizable; parses from LinkedIn, including picture; cloud-based; can do everything. Cons: It has so much available that it takes time to learn it well. Not much color on the GUI, but still looks nice. Pros: Has what we need from a both a CRM and ATS standpoint. Great team of people to work with. 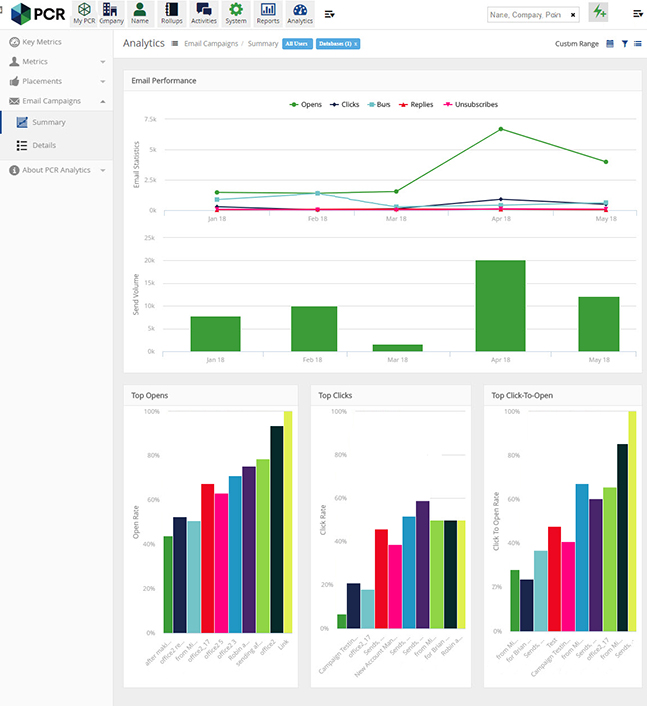 Cons: Would like some additional customization of analytics reporting functionality to reflect revenue model of our company that includes executive search, retained search, contract staffing and rpo. Overall: PCR helps us track overall sales metrics and tie it to sales revenue for our Search division. Because of PCR we are able to keep over our current clients and business development targets updated real time for our team across the country. Comments: As a user of their recruiting software, the transition to their ATS was simple. There are a lot of features so for new users it can seem overwhelming. However, asking a lot of questions on the front end and setting up the system to mirror your recruit flow and taking advantage of the automated systems will greatly enhance your experience. Great technical support and quick response at all levels. Pros: Lots of features, as a user the dashboard information is incredibly helpful, the system layout can be customized to accommodate your personal workflow. Cons: It's a complex system so for new users it will seem a little overwhelming. Manager portal is very weak from a UI perspective. Recommendations to other buyers: If you're looking for a system that will help you not only manage applicants but also act as a database for candidates for future use this is a great system. Be sure you have a defined applicant work flow process and ask questions on how the system can accommodate your needs. Comments: I am the IT and Business Consultant to a medium sized Recruiter / Placement Business that specializes in a niche market across USA. We have used the web based version of PCRecruiter for 8 years since 2008. As a medium sized business we did not want to fund a custom built program but needed the flexibility to be able to adapt the system in a similar fashion to having our own purpose built system and internal developers. I first evaluated PCRecruiter (PCR) against several competing products in mid 2008 and found it to be the most versatile for our purpose. The only program of it's type that delivered everything we needed, plus expansion possibilities, was PCRecruiter. Periodically I conduct a similar review for the business and have yet to find a system that offers an advantage over PCRecruiter. Pros: n the 8 years since we started using PCRecruiter we have expanded the system with several customized modules which have been possible within the system due to it's flexible architecture. Finally I would like to make special mention of the customer support which has proven to be second to none. Cons: I don't really have any - you tend to notice these more when something is not doing what you expect. Overall: We have been on PCR for a number of years now, and the ability to access the database whilst out of the office is a massive plus. They have a basic app that allows us to see contact details and notes, as well as being able to log in on the full site if needed. The system is able to be customised to your needs and although we are probably not using all the features, it does the job. The LinkedIn/ PCR add on, allows us to link the two profiles which is handy. Comments: My experience with PC Recruiter has been positive. When I was looking at ATS', I had a list of must have features. PC Recruiter was one of the few, that could deliver and at a better price than most. Pros: I like that we can produce templates for our interviews, with the questions we want to ask. The recruiter can pull up the template, ask the questions, not the answers, makes notes and save the document to the candidate's profile. Cons: Mobile app allows the user to view contact, company, or position details, but adding details like conversations, notes or schedules is not possible. It would be great to be able to have full usability on the app. Pros: It works! It provides us all the functionality we use on a daily basis. In fact, it provides far more than we actually use. Overall: We have been a customer for a long time. We evaluate the market and competitors products every couple years and continue to stick with PCR. We have found PCR to give us the all the necessary functionality at a great value. Training and support have always been very responsive! Recommendations to other buyers: You should consider this software when evaluating recruiting software. Pros: Fully integrated, no need for additional software. Cons: As a self-hosted user, there can sometimes be loading delays. This has less to do with the software and more to do with our hosting arrangements. Overall: PCRecruiter is a powerful recruitment package that allows for fast, effective and efficient recruitment solutions. All aspects are fully integrated (email, interviews, posting to job boards) and the customer service team are only an email away. Recommendations to other buyers: This software is fully customisable and very powerful. Worth the investment. Comments: Would highly recommend. This will save you time and money. Pros: The ease of looking up candidates that match the qualifications needed to fill our open job orders. The ability to search by keyword is a great time saver and allows your recruiters to spend more time being productive. Cons: Too many steps in the hiring process for general labor/manufacturing candidates. Overall it is a great tool and will save a lot of time. Great feature, makes adding through social media (LinkedIn) a breeze! Pros: I like the ease of being able to add people into the database through LinkedIn, it makes working between CRM's much easier. Pros: The customer support team has always been great to work with. The resources that are available allow many daily questions to be answered quickly--either by chat or by help articles. 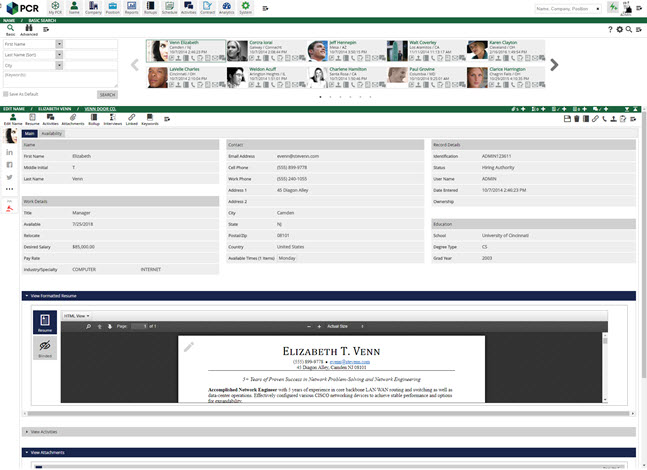 The interface is easy to navigate and all parts connect seamlessly. Cons: There are so many different things that PCR can do to make your life easier that it can seem overwhelming at times. Overall: Very good company overall. Pros: Rich and deep in functionality that allows the user to use the product on their terms. Frequent updates and very stable since the product has longevity. Outlook and social integration good. Cons: Could use a more robust mobile experience. Could also be a bit more intuitive in navigation and setup with the ability to create and post a note to several records automatically. Pros: The PCR Portal simplifies everything tremendously. It makes it easy to track everything directly from Outlook. Cons: There are too many ways to accomplish the same task making it somewhat confusing for new users to get a handle on the software. Overall: PCR has gone from one of my most dreaded resources, because it was a lot to learn, to one of my most valuable resources. I find it much more user friendly than other ATS applications. Pros: Outlook portal, Capture feature for social networks. Cons: Inability to link Chrome to the outlook portal when using the "Capture feature. Overall: We have been with PCR for close to 15 years, the new tools they have come out with making it easier to use than ever before. 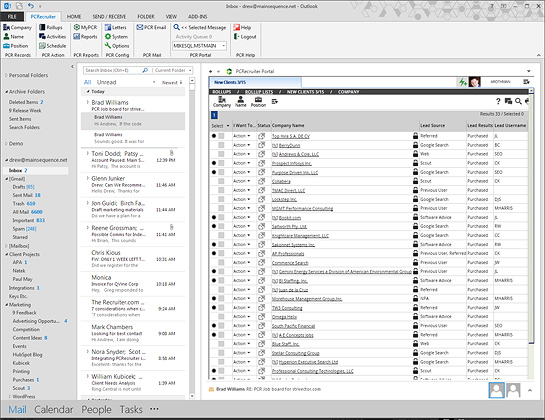 The "Capture" feature, the Outlook, portal, and the ability to integrate with our Outlook calendar are game changers. The training and tech support have been excellent as we are in the midst of a major database update. Pros: It's easy to use compared to other recruitment software programs I have used in the past. Overall: The team at PC Recruiter have been consistently very good over the years and as a business, we have been very happy with their service levels. The software program itself is user-friendly when compared to other recruitment databases and serves our requirements very well. I would highly recommend this software over other recruitment software out in the market currently. Pros: Very easy to use and simple for beginners to learn. Cons: Nothing, I've been working with PCR for several years. Overall: Stacy is fantastic. The software has enabled my business to grow through the roof and fosters our growth by providing a variety of features to help track anything/eveything you want. The training team, led by Stacy, is exceptional and there is not a question they cannot answer. Pros: Everything a recruiter could want is in the program. Everything is searchable, however see below. Customer service is great. Their people know you personally. Pros: I like Its versatility and capabilities. Especially the internet interface. PCR can do it all. The training and technical support is also very good (ask for Steve). Cons: It actually does so much I am only using a small fraction of its capabilities. Overall: I've been using PCR for over 20 years. Love it. Pros: The ease of use, functionality and responsiveness of their support and training staff. Overall: We have been using PCRecruiter for several years now and are very pleased. The support staff is excellent and very responsive, as is their training staff (special shout out to Nick Mazzone, who is great!). In addition, they keep coming out with new features and functionality that continue to make our recruiters and sales staff more efficient. Their Two Minute Tuesdays instructional videos are great for helping us to continue to take advantage of all the features. Pros: PCR can be customized to do just about anything you might need. It integrates well with LinkedIn through PCR Capture. Cons: The online instruction tool is not as detailed as it was in previous versions--you can't always find the answer to your question on basic things like formatting reports online. 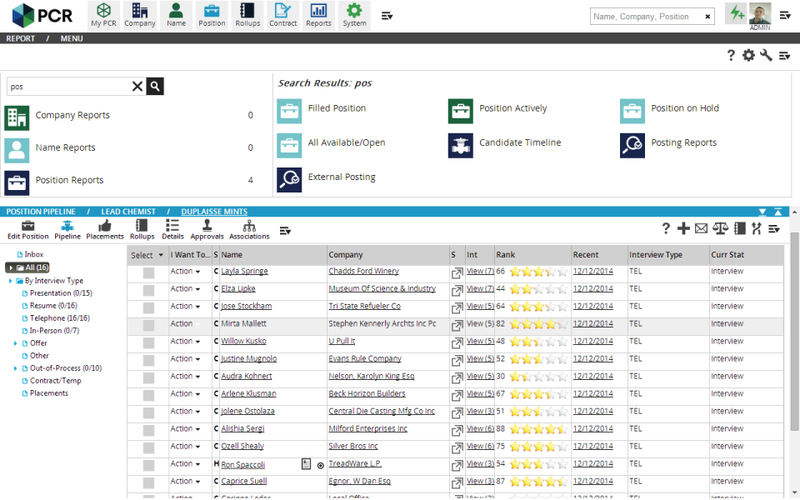 Pros: We've been very pleased with our version of PCRecruiter. When we have issues, customer service is awesome! Cons: Honestly can't think of a thing. So, no cons from me. Overall: This software serves our recruiting needs extremely well. I have been a customer of PCRecruiter since 2000. Pros: I love the fact that they are constantly improving, updating and adding new features and functions that make things easier in the digital world. I would recommend PCRecruiter to anyone whether you are a 40 man office or a "one man band". Technical support is great! Cons: Not many...perhaps the job order "process" could be improved. Recommendations to other buyers: I've worked w a number of other software packages in my career, and overall, this one has supported my business goals the best. Pros: Easy to use, good value and functional. Wheny you need support, they are very responsive. Cons: I would like to see more functions, make it a little easier to modify or add fields on the customer, job order or candidate record. Comments: We've been using this ATS for more than a year now and I find it is a great solution for us. It allows us to pull candidates from Monster.ca as well as LinkedIn very easily. So long as you take the time needed upfront to properly set up PCR for your company and learn all it can do then you will like it. Like any other ATS or any other system you use at your workplace PCR will only succeed for you if you use it properly and put the right information into it so you will always get the right information out of it. Pros: Low cost, ease of use. Email integration with Outlook is very helpful as well. You can customize the screens to a view that works best for you. Cons: Sometimes it does not pull all the contact information from a Monster search but it only takes a few minutes to manually add this information. The reporting features are a bit limited...I'd like to see some better reporting and the ability to export to Excel with better results. Comments: It's a great product. Keep up the good work! Pros: Having used it multiple times in the last 11 years, I've seen the product evolve and get better. Anything that was a problem 11 years ago has been resolved over the years and it's a wonderful product to use.